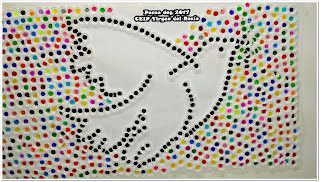 The School Day of Non-violence and Peace is an observance founded by the Spanish poet Llorenç Vidal Vidal in Majorca in 1964 as a starting point and support for a pacifying and non-violent education of a permanent character. It is observed on January 30 or thereabouts every year, on the anniversary of the death of Mahatma Gandhi, in schools all over the world. This year we are been wotking on a a lip dub that is a type of music video that combines lip synching and audio dubbing to make a music video. It is made by filming individuals or a group of people lip synching while listening to a song or any recorded audio then dubbing over it in post editing with the original audio of the song. Following Macaco's rhythm and his song "Love is the only way", we achived our own lipdub to celebrate the peace day this year. Click here and we hope you enjoy it! Hi students! How is it going? You already know that we are working on gymnastics this month. Some students have asked me about Acrosport and as you can choose the final activity, I want to share with you a presentation about it from the teacher Eduardo Madrera that can help you in this sense. Click here and enjoy it! Here you are some human figures from last year.